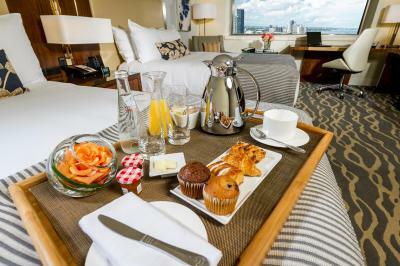 Lock in a great price for InterContinental Miami – rated 8.7 by recent guests! Location was excellent, hotel was very clean with excellent amenities. Great central location for south beach, wynwood, cruise port and Brickell areas. Unfortunately the new downtown evening vibe and restaurants are moving further south towards brickell and away from the hotel. However there’s a free and easy metromover just seconds away from hotel. Really enjoyed staying at the Intercontinental. The staff members who greeted us were lovely and able to provide a room with bathtub for both our rooms on request and were also quick to agree to a late check-out which was super useful! Beds are really comfortable, shower products smelt great and the shower with two shower heads was incredible. True to brand, decor and quality of the rooms and service was great! Good location, close to the free shuttle, airport and not too far from South Beach. Highly recommended. Gorgeous view from 16th floor towards cruise port. Great food and good location. The breakfast was good. The location was excellent. Great location, easy to walk to shops and restaurants. The location is really wonderful! The Bayside Market is just nearby, restaurant is easy to find there. And also you can find some fancy restaurant, like Wolfgang Steakhouse just 5 mins away. Transportation is easy to get, the free shuttle mover is just cross the street. 15 mins ride to the Miami beach. Great location that was close to bayside marketplace and river walk. Stores and restaurants were walking distance away from hotel. Great room and nice big bed with comfortable mattress. The location is amazing. The staff went above and beyond the usual duties to solve a problem I encountered with my cruise pssses. InterContinental Miami This rating is a reflection of how the property compares to the industry standard when it comes to price, facilities and services available. It's based on a self-evaluation by the property. Use this rating to help choose your stay! One of our top picks in Miami.With views of the Biscayne Bay, InterContinental Miami is set in Miami’s business district. The Port of Miami is 6 minutes’ drive from this luxury hotel. 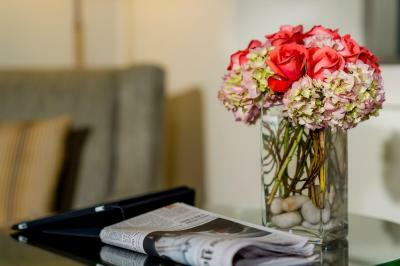 Accommodations are furnished with a marble bathroom, coffee maker, and a flat-screen TV with in-room movies and games. An en suite safety deposit box is provided, as is a mini-bar. Indulge at mySpa Miami, which offers 10 spa treatment rooms, a 24-hour fitness center, and a 60-foot outdoor pool and sundeck overlooking Biscayne Bay. A full-service business center and electric car charging station are also available. Five dining options are located on-site, including a Starbucks ® coffee and Toro Toro, a Pan Latin restaurant serving dishes for lunch and dinner. The Miami Beach Convention Center is 6.1 mi away. Guests will be 2 minutes' walk from the Bayfront Park Metromover Station and 0.7 mi from the AmericanAirlines Arena. 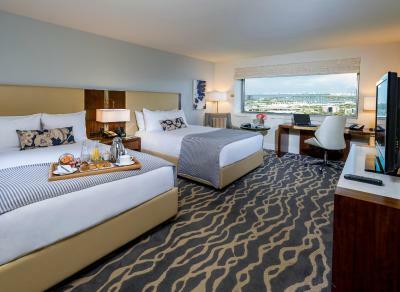 When would you like to stay at InterContinental Miami? 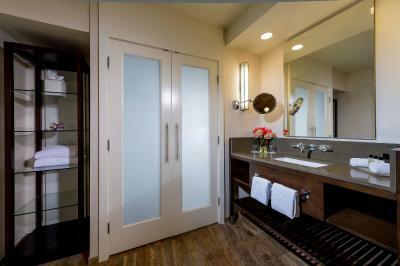 A marble bathroom, flat-screen TV, and coffee-making facilities are provided in this guestroom. A mini bar and safety deposit box are also included. Please note that the price is based on 2 guests and that there will be nightly surcharge for additional guests. Maximum occupancy is 4 guests. Private parking is available on site (reservation is needed) and costs USD 45.14 per day. 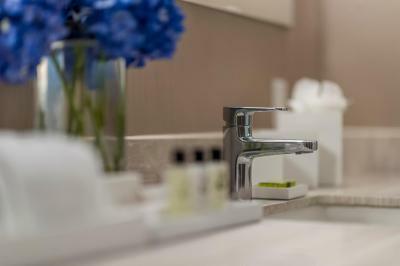 A marble bathroom, flat-screen TV, and coffee-making facilities are provided in this guestroom. A seating area with a sofa bed, a flat-screen TV, and in-room business services are available in this guest suite. This club-level room includes free access to the 24-hour gym and access to the club lounge with breakfast and drinks for up to 2 guests per room. A marble bathroom, flat-screen TV, and coffee-making facilities are provided as well. Offering a view of the harbor, this room features a marble bathroom, flat-screen TV, and coffee-making facilities. 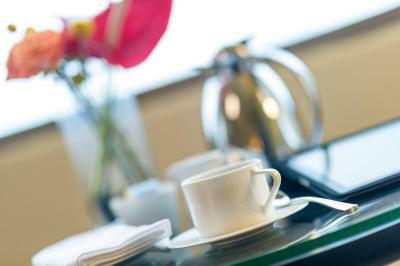 This guestroom includes disability access and features a mini-bar, flat-screen TV, and tea and coffee-making facilities. This guestroom is mobility-accessible and offers a flat-screen TV, accessible tub, and coffee-making facilities. Featuring a view of the harbor, this guestroom a marble bathroom, flat-screen TV, and coffee-making facilities. 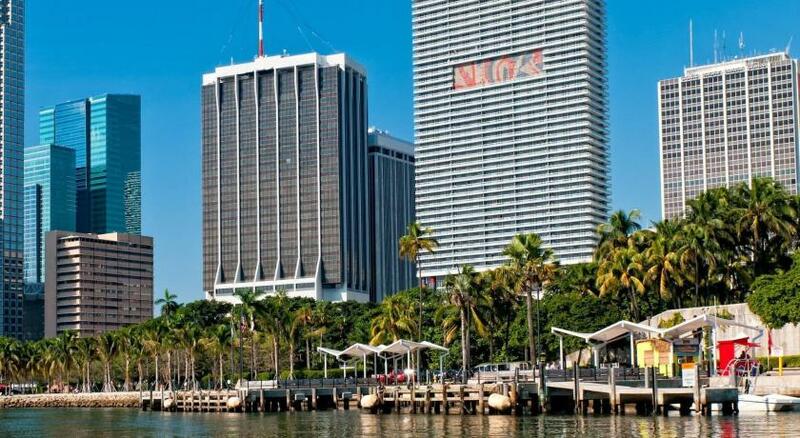 The InterContinental Miami sits on the shores of Biscayne Bay as an icon of the Downtown Miami skyline. The Hotel recently completed a $30M renovation which captures the pulse of the new Miami an evolving global Arts, Culture, Culinary and Entertainment destination. Conveniently located between the Brickell Financial District and the Port of Miami.We offer leisure travelers and conference/meeting groups a unique and diverse mix of work and play. House Rules InterContinental Miami takes special requests – add in the next step! InterContinental Miami accepts these cards and reserves the right to temporarily hold an amount prior to arrival. Please note that the guest name and credit card used at time of booking, and valid ID must match and be presented at time of check in. Please note that charges may apply for storing guests' packages. Please note that breakfast-included rates are for a maximum of 2 guests. Breakfast for any additional guests will incur a surcharge. Please note that there is an additional charge of USD 30.00 for any guest above 2 adults. One of the rooms had a non-functioning outlet in the bathroom and the other rooms' mini-bar was locked. Both could have been resolved with a call, but since only there for one night we did not bother. Not practical toilet paper holder and location. Toilet itself was also not powerful. Nice location near Bayside. Clean hotel, nice stuff, Starbucks in the lobby, perfect buffet breakfast. Recommended!!! We found the lobby to be so extremely cold, it was impossible to enjoy it which is a shame as it is beautiful and has a nice bar. We had a room with 2 beds and found that the beds were very small for 2 people. Everything was fantastic. Wish I could have stayed there longer. Bathroom was a little dingy. Hi I hope all is well, I have to say that this trip has been one of the worst experiences I’ve had with bookings.com. On arrival when picking up the keys to apartment they only gave me the room key so when I got to the building I was unable to enter so I had to wait outside for almost an hour until someone came in which by that time it was gone 1am in the morning, I then wasn't given the code to the room door so I had to knock on neighbours door to disable the electronic lock which didn't go down well, I then had to go back to the pick up location the next evening to get the building key. The following morning I was woken up by staff that entered my room without warning and said that I had to leave as I needed to check, this went on for 2 hours with various people coming to the room knocking on the door demanding I have to check out baring in mind this started at 9am which wasn't even the check time anyway, I then had to call the manager in which they confirmed there had been a mistake. This happened again the following morning which really annoyed me as I'm in Miami on business and have been doing late nights. One of the worst things was that the apartment is VERY unsecured, to top it off the front door doesn’t lock properly and it take sometimes up to 10 minutes to position the door to get the lock into the hole as its very unsafe. I soon realised that the door could be opened by anyone by simply pressing the main unlock button on the electric lock system and turning the lock left so I had the constant worry that anyone at anytime could simply walk into my room whilst I was sleeping and also get into my room in my absence, I traveled with £60,000 worth of high end watches which are my personal belongings and over £3,000 worth of designer shoes which I was to worried to leave in the room so had to bring with me everywhere I went which is crazy. The bed is like cloud. The bathroom was falling apart. Paint peeling and faucet loose. It was on a floor that was being renovated, so maybe that was why. The last time we stayed it wasn't like that. The room could be better for the price charged.